A new UNU-IAS Policy Brief highlights the progress being made by governments in the Asia and the Pacific region to implement the 2030 Agenda while providing recommendations to further strengthen the mainstreaming of Sustainable Development Goals (SDGs) into national policy processes. 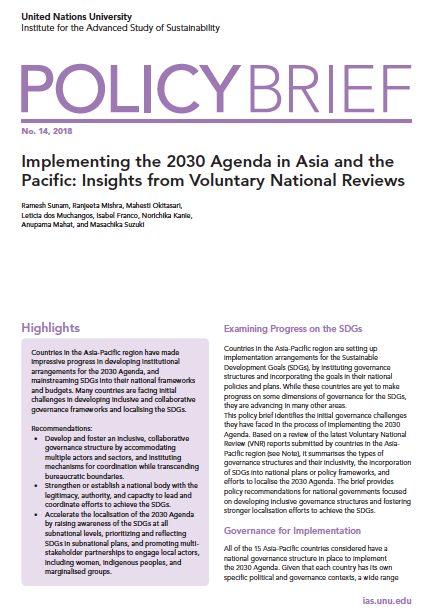 Implementing the 2030 Agenda in Asia and the Pacific: Insights from Voluntary National Reviews was co-authored by UNU-IAS researchers Ramesh Sunam, Ranjeeta Mishra, Mahesti Okitasari, Leticia dos Muchangos, Isabel Franco, and Norichika Kanie, along with two external collaborators. It identifies initial governance challenges through a survey of Voluntary National Reviews (VNRs) and offers guidance for national governments on developing inclusive governance structures and fostering stronger localisation efforts to achieve the SDGs. Countries in the Asia-Pacific region have made impressive progress in developing institutional arrangements for the 2030 Agenda, and mainstreaming SDGs into their national frameworks and budgets. Many countries are facing initial challenges in developing inclusive and collaborative governance frameworks and localising the SDGs. Develop and foster an inclusive, collaborative governance structure by accommodating multiple actors and sectors, and instituting mechanisms for coordination while transcending bureaucratic boundaries. Strengthen or establish a national body with the legitimacy, authority, and capacity to lead and coordinate efforts to achieve the SDGs. Accelerate the localisation of the 2030 Agenda by raising awareness of the SDGs at all subnational levels, prioritizing and reflecting SDGs in subnational plans, and promoting multi-stakeholder partnerships to engage local actors, including women, indigenous peoples, and marginalised groups.